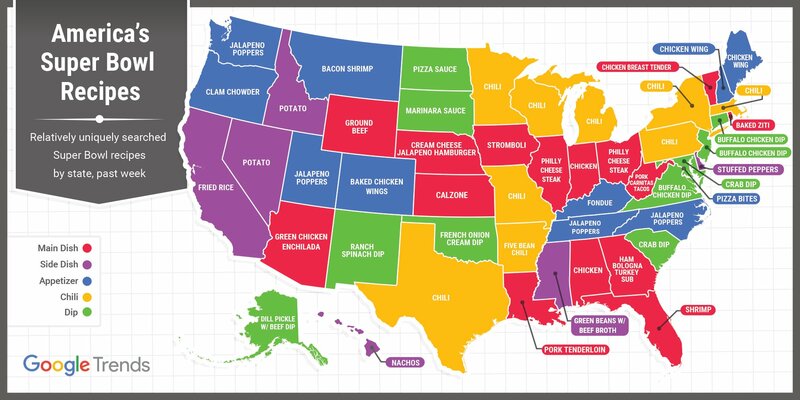 In 2018, our friends at Google Trends tried to identify local preferences on Super Bowl food recipes based on search traffic by state. Specifically, they created a a 50-state map identifying "relatively uniquely searched Super Bowl recipes by state". A number of right-thinking states had chili atop their list. A couple of Georgia's neighbors were tagged for their interest in jalapeno poppers. But the entry for Georgia had us scratching our heads. Not chicken wings, or guacamole dip or nachos. Instead some of you are searching for a sub recipe that contains baloney. If you are searching for a great recipe for Ham Bologna Turkey Subs in Georgia, more power to you. But there are other options. We have gathered up a few favorite Super Bowl finger food and snack recipe ideas from AJC and Cox Media Group writers. On the baloney thing, it could be worse. The map entry for Mississippi is Green Beans. With Beef Broth. For Super Bowl? Want something a little healthier? Try this recipe from AJC food writer Kellie Hynes for a healthy but tasty buffalo veggie chili. Change up the spread with some pizza sliders. These are the hot sammies no one saw coming. AJC food editor Ligaya Figueras brings you the recipe here. Buffalo-style chicken wings and chicken nuggets are deep-fried deliciousness. This recipe marries the two and, incredibly, does so in a way that simultaneously satisfies the soul and keeps the blood whistling through the old arteries. Get the recipe on the AJC Atlanta Restaurants blog. A chicken wing recipe is like a chili recipe: Everyone needs to have one. This recipe by bestselling cookbook author Francine Bryson has wings that aren’t breaded or fried. If you're anything like Kate Williams from SouthernKitchen.com, you go to Super Bowl parties for one reason, and one reason only: food. What with guacamole and chip 'n dips galore, plus big bowls of chili and platters of wings, there's plenty of food to entertain those of us who don't know a fourth down from a ... conversion? Get 12 tips and tricks (some of them recipes) for a great game day party. Can you watch the Super Bowl without wings, nachos and pizza? We don’t think so. Here are three things you might want to offer your guests. AJC food writer C.W. Cameron offers suggestions for your shopping list. Sure, the Super Bowl is all fun and games...but how much is it costing you? Take a look.